SAW the video game for xbox360? In the past, few movies have made a real mark in the videogame world, now the Saw movie franchise will try its hand at this daring move. The guys over at Brash have already put up a web site dedicated to the game, so its safe to say the game is a sure thing at this point. Brash Entertainment has already said the game will be built on the Unreal Tournament III engine and won't be coming out until October, 2009. One can only speculate what this game will hold for the gamer, but my guess would be its going to be packed with puzzles, the mans name is Jigsaw for crying out loud. I'm sure we are as excited to try this game, as the ESRB will be too shoot it down and censor all the good stuff. 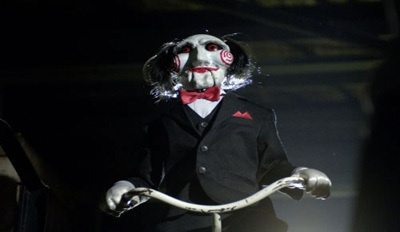 Only time will tell and all i know is, I WANT TO PLAY A GAME. Will SAW The Video Game Be The Next Silent Hill? SAW the video game, Live Stream. Saw The Video Game on it's way! Saw The Video Game for Xbox 360? ?